Oscar de la Renta Patterned Corduroy Dress. The Real Real. Was: $425. Now: $297. Pssst…. Poplin is an affiliate which means that when you click through on the images below, Poplin may receive a commission on your purchase at no additional cost to you. These dollars and cents add up. So, if you find something you like, please consider clicking through. Thanks and happy shopping! BLANKNYC Corduroy Moto Jacket. Nordstrom. $98. PAPER London - Twin Stretch-cotton Corduroy Wide-leg Pants . Net-a-Porter. $330. See by Chloe Wide-Leg Corduroy Cropped Pants. Neimans. $375. Veronica Beard Orial Short Zip-Front Corduroy Dress. Neimans. $495. High waisted pants, 70’s inspired skirts and skinnies are all on deck for fall. If you are looking at your pants from a few years ago, just make sure the cut feels modern before you reintroduce them to your collection. Pacsun Sienna Corduroy Overalls. Pac Sun. $69. 2. Make sure it’s you. Don’t sacrifice your personal style regardless of the trends. Does this piece feel like you? Does it make you more confident or happy when you wear it. If not, it’s time to reassess. 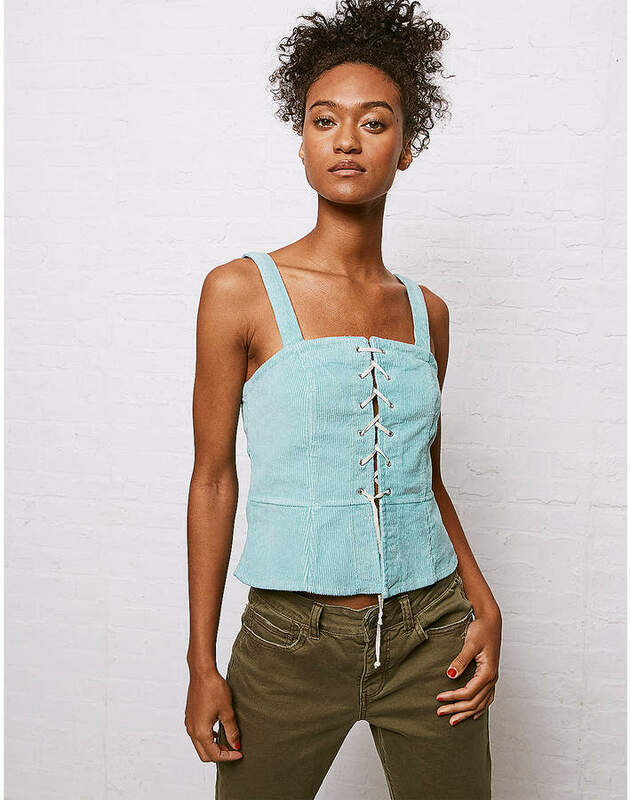 Aeo Don't Ask Why Corduroy Lace-Up Tank. American Eagle. $34. Hue High-Rise Corduroy Cropped Leggings. Saks Off 5th. Was: $44. Now: $24. 3. Make sure it’s flattering for your frame. The wave of corduroy pieces tend to have a few themes. First, a number of them are masculine-inspired. Think traditional Levi’s jacket, but in corduroy. Or the same jacket lined with sheepskin. Masculine styles work best for women with triangle, diamond and hourglass shapes. Lots of pieces right now are 70’s inspired. This is awesome, if that’s your jam. As far as fit goes, flare styles are great on all body types (as long as your legs are long enough to wear them full length.) Go with a heel to look your best. We’re seeing lots of mini skirts. If you are short waisted, these are great for you as they elongate your legs. Petite women, women with a diamond shaped or rectangle frame also look stellar in short skirts. You’ll see lots of a-line options. Those are ideal for, well, nearly everyone. Boxy jackets and dresses work well for women with a diamond shaped frame and skinnies are glorious on women with hourglass, rectangle and diamond shapes. If you have an inverted triangle shaped figure, go with flared pants or a bold color for skinnies. A collection of some of my favorites are below. If you are on the Poplin email list, this week’s newsletter will highlight a number of pieces that you can pull out of the back of your closet or try for the first time. Make sure you are signed up! Corduroy Buttondown Skirt. Anthro. $148. Theory Corduroy Jacket. The Real Real. Was: $125. Now: $62. KIMHEKIM Corduroy turtleneck top. Lane Crawford. $150. 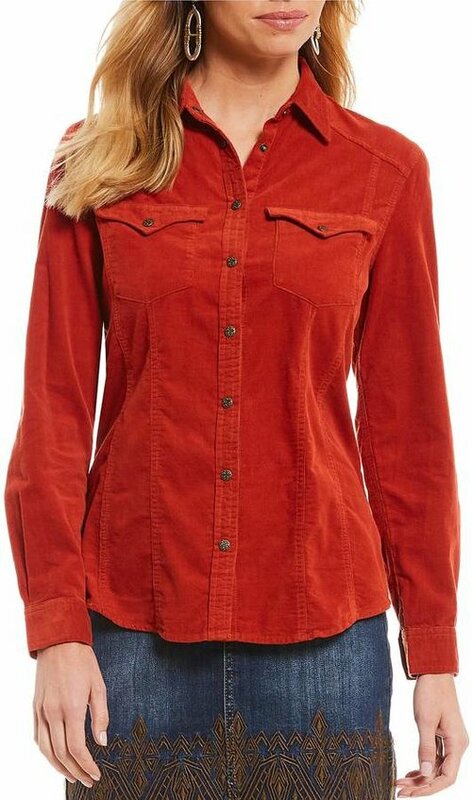 Reba Corduroy Shirt. Dillards. $88. J Brand Joan High-Rise Cropped Corduroy Pants. Niemans. $228.